I have just completed my Dissertation project looking at queer representations of masculinity in screendance practice. Being surrounded by likeminded individuals on the course, as well as present at passionate and knowledgeable lectures, really made my time at the University of Chichester stimulating and enjoyable. The MA Dance Masters by Research enables students to develop their own research interests and, supported by tutors design a programme of dance research that addresses specific areas of interest, as an example, projects might explore areas such as; Dance and Postmodernism, Community Dance Practice, Dance in Education, Popular Dance, Site-Specific Dance Practices, Dance and technology, Dance Film, Dance and Interdisciplinary Arts Practices, Dance History, Dance and Politics. Guest lecturers on the MA include scholars, practitioners and curators all working in innovative areas of dance research. Our dance facilities include four superb dance studios, a fully-equipped 250-seat theatre and a 110-seat studio theatre. In addition, there is a newly refurbished large gymnasium space together with two new sprung-floor spaces in the new academic building. Our students will use the facilities within our dance technical team to enhance their understanding of scenography, sound and cameras, and the editing suites to support their choreography and creative practice situated in the Learning and Information Zone of the library. This course is suitable for you if you are a dance / arts professional, teacher, recent graduate or a dance artist who wishes to extend their research skills. Your research skills will be facilitated through the formulation and realisation of a self-directed research project in broadly based dance practices, which underpin the MA programme. You will be expected to contextualise your work in the light of contemporary developments in dance research. The Dissertation emphasises independent research where you select an area of investigation with the advice of tutors. This may arise from earlier modules studied on the degree. The research may focus on performance practice, professional practice (i.e. teaching and community dance practices) applied critical, historical or epistemological issues. 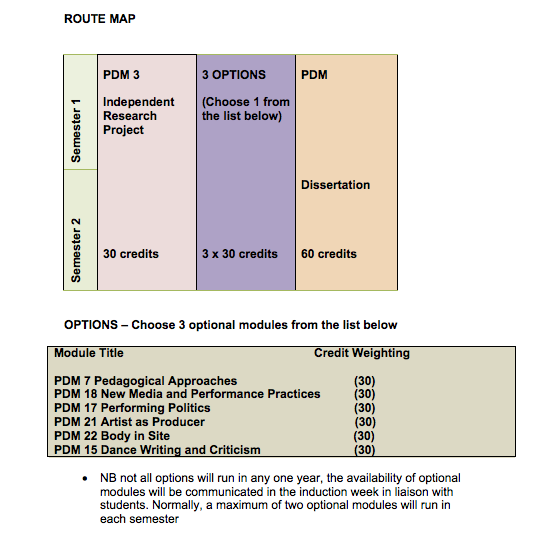 In addition to the two core modules, students are required to select two optional modules, these normally include options such as; Artist as Producer, Pedagogical Skills, Body in Site, Dance Writing and Criticism, Performing Politics. Assessment for this programme employs various methods chosen as the most appropriate for demonstrating achievement of the learning outcomes for each module. All modules are assessed by means of programme work in the form of essays, practical choreography presentations, ,reports, presentations, learning journals, portfolios, online tasks and group working. Learning is assessed using various methods chosen as the most appropriate for demonstrating achievement of the learning outcomes for each module. All modules are assessed by means of programme work in the form of practical choreography presentations, essays, reports, presentations, learning journals, portfolios, online tasks and group working.